Fibromyalgia is now recognized as a rheumatic disease characterized by widespread pain throughout the body, often associated with extreme fatigue and disturbed sleep. Although fibromyalgia causes chronic muscle pain, no injury is apparent in the muscles. Many factors are probably responsible for the disease’s symptoms: decrease in pain perception threshold; decreased levels of neurotransmitters, such as serotonin; stress, anxiety, depression, sleep disorders; viral infections, such as hepatitis C or B, or the bacteria that causes Lyme disease; trauma to the cervical vertebrae after a car accident; emotional trauma, etc. Our proprietary white pine bark extract is standardized to 95% proanthocyanidins. As well as its proven anti-inflammatory effects,7 its exceptional antioxidant action ensures constant elimination of oxidation-causing free radicals. We have also added berry extracts to Annedda ANTI-INFLAMMATION®: blueberry and cranberry extracts, both rich in antioxidizing anthocyanidins; and rosehip berries, rich in vitamin C, another antioxidant. 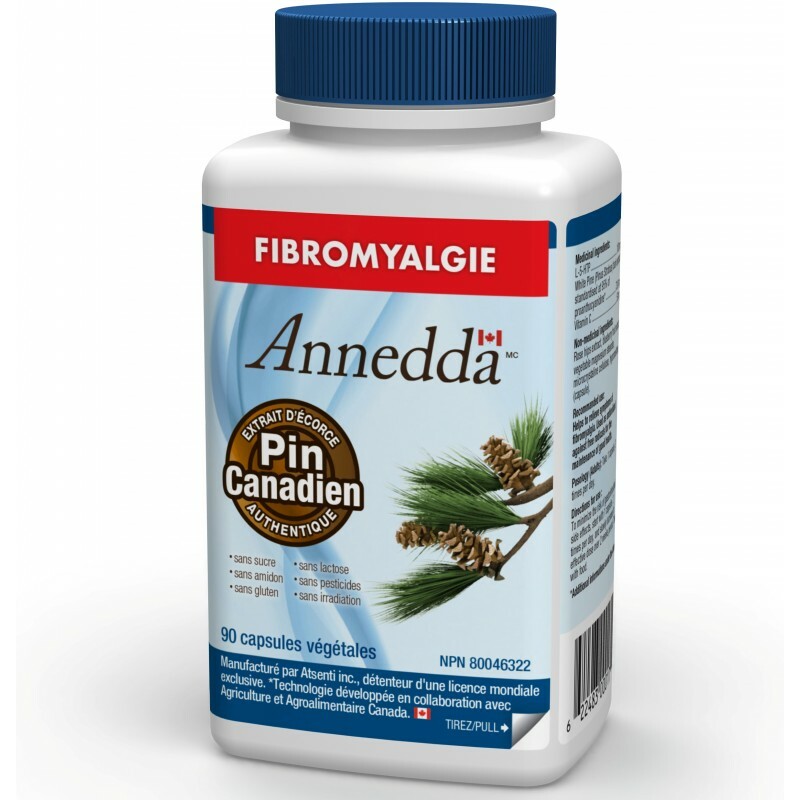 Annedda FIBROMYALGIA® relieves pain as effectively, if not better, than traditional anti-inflammatory drugs without causing the kinds of adverse effects that are increasingly associated with synthetic medications. Some of these anti-inflammatory drugs have even been removed from sale due to these adverse effects (e.g. Viox®), while the use of others is often limited for the same reasons (Celebrex®, ibuprofen, etc). We have also added L-5-HTP to Annedda FIBROMYALGIA®. This amino acid is naturally produced by the body and acts as a sort of building block that the body uses to synthesize essential proteins. This ingredient has the ability to do what very few substances can do: enter the brain. Once in the central nervous system, L-5-HTP stimulates the production of serotonin, an important neurotransmitter that regulates anxiety and depression. Research has shown that patients with fibromyalgia are under oxidative stress caused by an abnormal proliferation of free radicals in their nervous systems.5 The proanthocyanidins found in our white pine bark extract also have the ability to enter the brain, which means they can access the central nervous system and exercise their antioxidant action. This counteracts the harmful effects of free radicals on neurons. Rosehip extract, blueberry extract, vegetable magnesium stearate, microcrystalline cellulose, hypromellose (vegetable capsule). To minimize the risk of gastrointestinal side effects, start with 1 capsule 2 times per day, then slowly increase to the effective dose over a period of 2 weeks. Take with food. Take for at least 2 weeks in order to gain the maximum benefit. Consult a health care practitioner prior to use if you are taking carbidopa or drugs/supplements with serotonergic activity, including L-tryptophan, S-adenosylmethionine (SAMe), St. John’s wort, antidepressants, pain medications, over-the-counter cough or cold medication containing dextromethorphan, or medications for nausea or migraine. Discontinue use and consult a health care practitioner if you experience weakness, mouth ulcers or abdominal pain accompanied by severe muscle pain, or if you notice skin changes. Some people may experience drowsiness. Use caution when driving heavy machinery or any other motorized vehicle, or if your activity requires mental alertness. Some people may experience diarrhea, nausea, vomiting or abdominal pain. Do not use if you suffer from scleroderma. 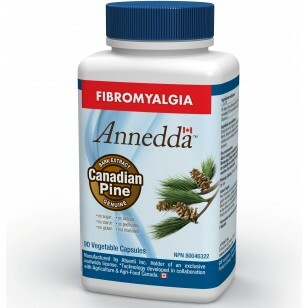 You will quickly experience significantly reduced pain after taking Annedda FIBROMYALGIA® You will feel an improvement from the first weeks and progress will continue if you keep taking the treatment. If relief is slow in coming, it may be appropriate to supplement your treatment with Annedda ANTI-INFLAMMATION® for a few weeks. This contains turmeric, another natural anti-inflammatory that may help to relieve you in the early stages. You can stop taking this product as soon as the treatment begins to take effect and then just continue with Annedda FIBROMYALGIA®. You should also take the opportunity to get outside every day, even in winter, especially when it is sunny. It only takes about 20 minutes of exposure to the sun, even if just the face and hands, for your skin to produce enough Vitamin D3 to help counter low grade inflammation. To sustain your body and to help prevent symptoms from reappearing, avoid sugar and limit your intake of carbohydrate-rich foods, such as wheat, rice, potatoes and pulses. These foods can lead to excessive fluctuations in blood sugar levels. Eat plenty of fish and other seafood as these are rich in omega-3 fatty acids. Green vegetables, nuts (walnuts, hazelnuts, almonds, etc.) and colourful berries (blueberries, strawberries, raspberries, cranberries, etc.) are good sources of antioxidants so you should aim to incorporate as many of these foods in your diet as possible.